There is lots to say about the eco-friendliness of April Hannah’s designs – entirely crafted from sustainable materials, right down to soy-based glues and non-toxic, formaldehyde-free finishes. Hannah sets her work apart by catering to the five-to-ten-year-old market. 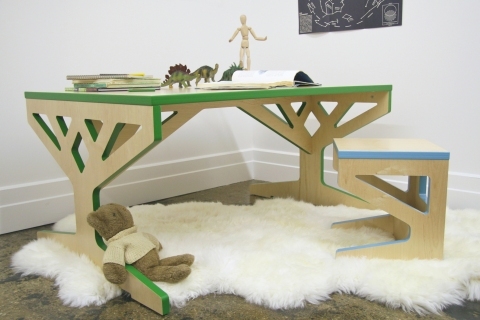 Recognising a need for a larger table and seat for children who are beyond the toddler years but not quite big enough for an adult table or desk, Hannah created the superb Tree Table collection. 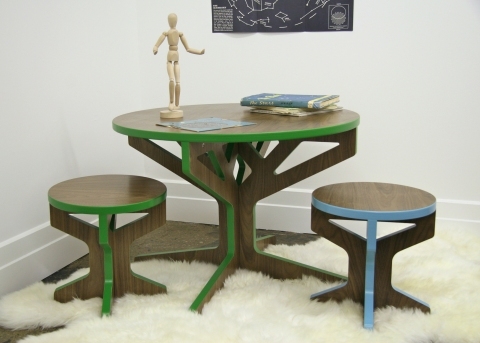 The Tree Table collection is simple yet organic – cut-out branches hold tabletops and stool seats aloft. Cool blue, green or white is used as a colourful trim on either maple or walnut veneers. The playful, elegant design and attention to practical detail gears these pieces for the school-age market – large, flat work surfaces just right for spreading out that big poster project and stools with useful additions such as a ‘storage pocket’. Best yet, the pieces don’t scream ‘kids’ and fit beautifully with any modern decor. Contact April Hannah for prices and shipping costs (note that pieces are shipped flat-packed). Thanks to Babyology reader Ursula for discovering the Tree Tables.